Your adventure begins aboard one of our boats custom designed to provide an intimate viewing experience. During your 40 minute journey through North America’s deepest fjord, keep a lookout for whales, seals, and cascading waterfalls while your Naturalist guide tells you more about the area you are traveling through. Upon arrival at the remote Glacier Point beach, you will have a short, adventurous drive across the forested glacial moraines to our base camp, where you will gear up in rubber boots and a life jacket. After a ¼ mile walk, the forest opens to reveal a breathtaking view of the Davidson Glacier and pristine lake below. 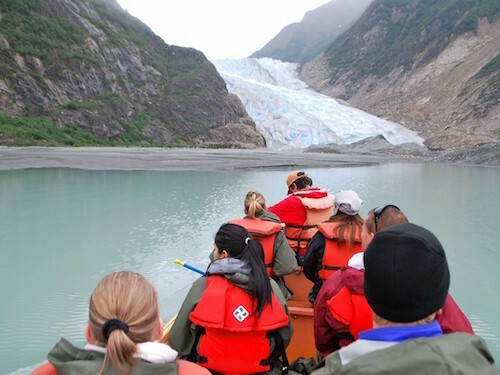 Here you will board a 31-foot voyager canoe for a trip around the lake to view the glacier and enjoy the incredible Alaskan wilderness while your guide shares their extensive knowledge of the area. After returning to the base camp, enjoy a picnic lunch on the beach before your return trip on the catamaran. This is an ideal family adventure and one you certainly won’t soon forget! Please note: Must weigh between 50 and 350lbs. Guests must be in good physical condition and able to hike approx. ¼ mile over natural terrain. Picnic lunch is included.